CorkSport is pleased to expand our single exit exhaust offering to include the new Mazda 3 SkyActiv model! The CorkSport Power Series Single Exit 60mm Exhaust has been designed to work with both the 2010+ sedans and hatchback trim standard 2.0 liter and SkyActiv engine models. 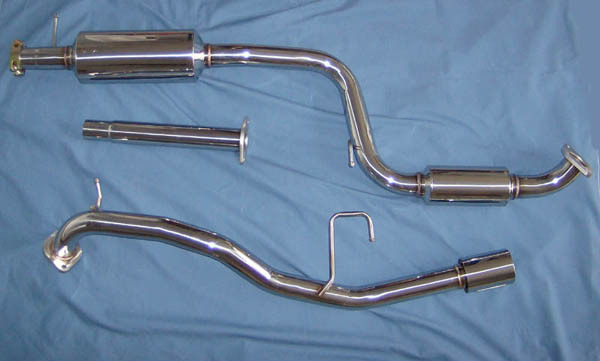 Featuring dual resonators, a slip fit compression connection to the aft end of the catalytic converter and a single tailpipe design, the CorkSport Mazda 3 exhaust replaces the factory tailpipe muffler with polished 2.4 ID stainless steel piping and non-resonated CorkSport dual wall 90mm exhaust tip. During testing with the CorkSport SRI and single exit exhaust on the 2.0 liter model, the CorkSport Mazda 3 Power Series Single Exit Exhaust went from a baseline of 118hp/110lb ft. of torque to a respectable 135hp and 123lb ft. of torque at the wheels. The 2.0L results are moderate at the bottom end (with around a 4-5hp/tq gain) below 4000rpm with the majority of the power coming on rapidly at around 4500rpm and held steadily to the 7000rpm redline demonstrating the constrained nature of the stock system for the smaller 2.0L engine. As with all of our CorkSport exhausts, the Power Series Mazda 3 single exit design features mandrel bent, polished stainless steel T304 construction for corrosion resistance and a clean stylish look. It has a distinctive performance sound that is mild but noticeable at cruise and idle and a distinctive growl at wide open throttle and free rev. It sounds nice but, with aftermarket engine and intake add ons, don’t you need a tune? Tunes are highly recommended for anyone who has three or more bolt on parts. I haven’t found anyone anywhere to have a programmer or tuner for the Sky Activ yet. Any ideas?